The biggest mistake that car buyers in Glendale Heights and Bloomingdale can make is driving off the lot in a new car that doesn’t fit into their budget and meet all of their transportation needs. 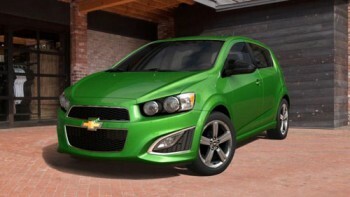 If you’re in the market for a new car that is affordable, efficient, and fun-to-drive, you’ll want to consider both the 2016 Chevrolet Cruze and the 2016 Chevrolet Sonic. Find out what sets these two exciting models apart, and decide which one better meets your needs. After that, head to Sunrise Chevrolet in Glendale Heights to check out one or both. The standard engine produces 153 hp and 177 lb-ft of torque. Apple CarPlay and Android Auto come standard with the base trim. A roomy cabin and trunk offer plenty of space for anything and everything. The MSRP starts at only $14,345. An available hatchback configuration provides easy loading and unloading. The Sonic earned a five-star overall safety rating from the NHTSA. The difference of only 10 horsepower makes a big difference in how two cars perform, especially when you are looking for speed in the city and power on the highway. 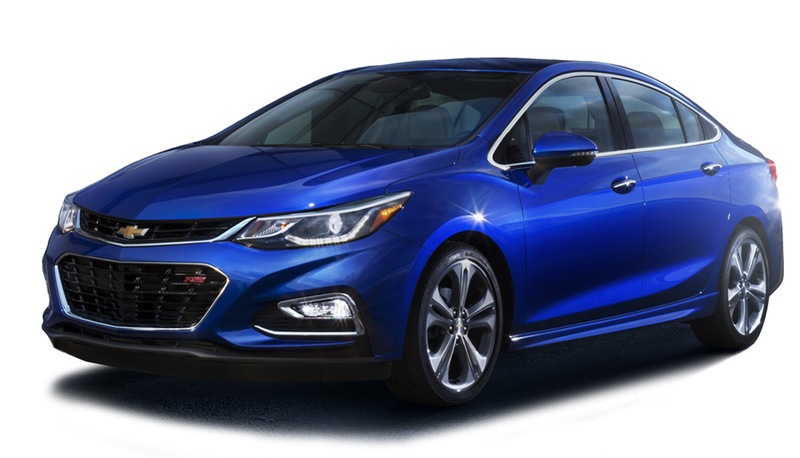 The fully redesigned 2016 Chevrolet Cruze comes standard with a turbocharged 1.4L four-cylinder engine that produces 153 hp and 177 lb-ft of torque. 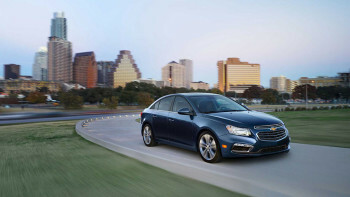 On top of that impressive power, the all-new Cruze is able to get up to 30 mpg in the city and 40 mpg on the highway. That balance is hard to find in another car. 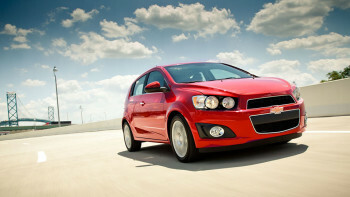 The 2016 Chevy Sonic offers a little less power but similarly great fuel economy. The standard engine is a 1.8L four-cylinder that produces 138 hp and 125 lb-ft of torque while getting up to 26 mpg city and 35 mpg highway. Also available is a turbocharged 1.4L four-cylinder that also puts out 138 hp but boosts torque to 148 lb-ft. Fuel economy also improves to 29 mpg city and 40 mpg highway. This is the area where the two cars really differ. 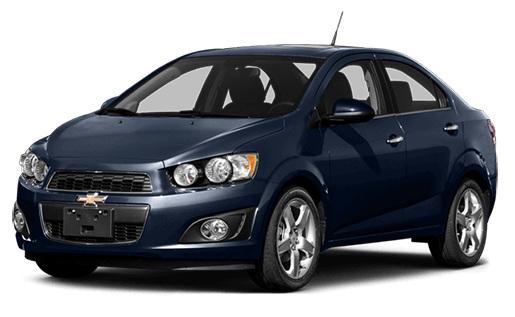 The 2016 Chevrolet Cruze is considered a compact sedan while the 2016 Chevrolet Sonic is a subcompact sedan. Generally, the Cruze will feel like a bigger car overall, both for the people riding in it and for anyone loading up the trunk. The Sonic, however, is also available as a hatchback. In that configuration it offers a lot more overall cargo capacity and the opportunity to use the entire cabin for storage, with 19.0 cubic feet of dedicated storage space and 47.7 cubic feet with the rear seats down. Neither of these cars feels stripped down, but the 2016 Chevrolet Cruze generally has a more upscale feel. 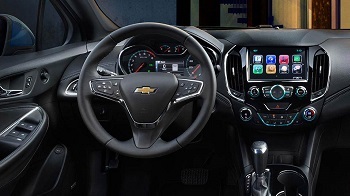 The introductory trim comes equipped with a rearview camera and the Chevrolet MyLink infotainment system, both operated through a seven-inch touchscreen. You can access many of your favorite smartphone apps through the touchscreen thanks to Android Auto and Apple CarPlay. On upper level trims you will find premium features like ambient interior lighting, advanced safety features, and sport styling that gives the Cruze a truly dynamic look. On the 2016 Chevrolet Sonic you get remote keyless entry and OnStar with 4G LTE Wi-FI, even on the intro trim. Higher up the trim ladder, you will find a sunroof, satellite radio, and heated seats. These cars are both very similar and very impressive, which can make choosing between them a real challenge. There are three factors that should weigh heavily on your decision. First, remember that the Chevy Cruze offers more overall power and better standard gas mileage. Second, decide if passenger or cargo room is more important for you, and keep the Sonic hatchback option in mind if you need a lot of room for storage. Third, think about how upscale you want your car to feel and whether or not you’re willing to pay more for that. These cars are both close in price, but the Cruze costs a little bit more to start and comes with more standard and available features and a higher quality interior as a result. Both of these models are available to tour and test drive right now at Sunrise Chevrolet. Visit us in person Monday through Sunday, and work with our friendly team of Chevrolet experts. We are located at 414 North Avenue in Glendale Heights, IL which is just 10 minutes from Bloomingdale. Reach us by taking Glen Ellyn road south and turning right at the Brunswick Zone location. If you have any questions about the cars, the directions, or the dealership, please contact us.